Very limited supply again this year! Fresh pecan halves from Pecan Point Farm. There is a world of difference between these fresh pecans and the pecans you find in the grocery stores! Grown with sustainable practices and gently harvested, our pecans are high in flavor and natural oils, making them perfect additions to all manner of desserts, meals, and snacks. Non-GMO. We grow primarily Elliot and Cape Fear pecan varieties. Contact us for bulk pricing. 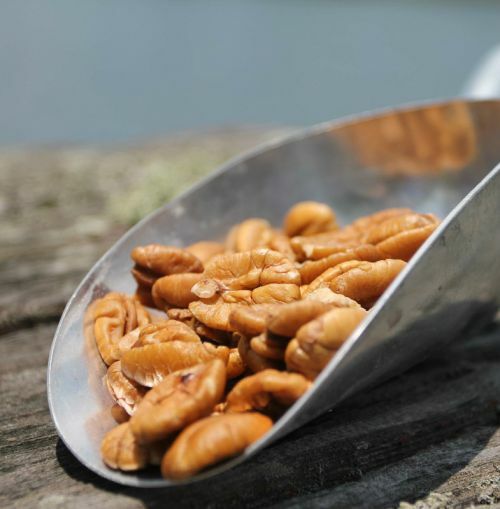 *What makes your pecans different from most conventionally grown, retail pecans? *You mentioned artificial fertilizer. Do you use it? *Why not go organic and completely eliminate pesticide use entirely? *What is the size of your orchard? *What’s the difference between Cape Fear and Elliot pecan varieties? What makes your pecans different from most conventionally grown, retail pecans? We favor a sustainable management system, low in chemical inputs, that’s heavily focused on the health of the soil. We believe strongly that if our soil is healthy and robust, our pecans trees—and by extension, our nuts—will follow suit. Consider, for example, the orchard floor. Large commercial growers tend to rely heavily on herbicide applications (like Roundup) to kill weeds and grasses, effectively clearing stretches of barren dirt under the canopy. This reduces the need for mowing and makes the process of applying soil amendments, like artificial fertilizer, more efficient. It also makes it easier to collect nuts in the fall. But there’s some evidence that these practices can be hazardous to soil microbes, which are important in maintaining fertile topsoil that holds moisture and makes micronutrients available for utilization by the trees. For these reasons and others—our cattle graze in our orchards—we choose not to use herbicides. Instead, we manage the orchard floor for the growth of select vegetation, such as crimson clover, Crepe Myrtle, elderberry, and hairy vetch. Not only does our vegetation, for instance, release nitrogen into the soil, a boon for our microbes and trees; it also provides habitation for beneficial insects that predate on aphids, pecan weevils, and stinkbugs—pests that destroy pecan production. As a result, we’re able to greatly reduce the scope of our pesticide program—from twelve to fourteen sprays a year, typical for large commercial growers, to one or two applications that would not be approved for organic use. (And of those, none preclude our cattle from grazing in the orchard—not the case for restricted chemicals commonly used in commercial orchards.) Because of our low-input approach and resistance to synthetic chemical use, we experience lower yields per acre than most commercial orchards. But in return, we believe we produce a higher-quality, more flavorful pecan that’s packed with nutrients. As we’re fond of saying, good soil grows good food! Additionally, we live, work, and recreate in our orchard, along with our family and friends. This further compels us to employ gentler, more sustainable land management practices. Some of the more noxious, restricted pesticides will advise growers to vacate their orchard for at least two days after application. We’re not spraying those in our backyard! You mentioned artificial fertilizer. Do you use it? We do not inject synthetic fertilizers into our soils. Artificial fertilizer can bring quick results, boosting growth in as little as two weeks. But results are rarely long lasting, and such fertilizers can easily volatilize into the air or run-off and contaminate nearby streams and lakes. As with certain other aspects of chemical agriculture, we’ve found artificial fertilizers to be a poor choice for the long-term health of our land. Instead, we’ve chosen to make yearly applications of composted poultry litter to our orchard floor. Poultry litter is a source of nitrogen, like synthetics, as well as other essential minerals. But it releases its nutrient base more slowly, stimulating growth over a longer period of time. We also find that poultry litter is more effective at nurturing microbes and building organic matter into the soil. This approaches thus increasing the soil’s water-holding capacity so that our orchard is more drought resistant. Why not go organic and completely eliminate pesticide use entirely? We are always looking to communicate with other growers and experiment with novel practices that might allow us to reduce our pesticide use even further. But lower Alabama’s humid climate presents many challenges to growing pecans. The main one is pecan scab, a fungus that thrives on wet environments. Over the past few years, scab has devastated pecan orchards throughout the Southeast, and we’ve been no exception. (The vast majority of organic pecans, in fact, are grown in the Southwest where the climate is drier and pecan scab is less of a threat.) Because of our greatly reduced use of insecticides and fungicides, we already suffer higher losses than neighboring orchards, and are afraid, at present, that our losses could be near total without a strategically targeted spray program. What is the size of your orchard? Our orchard spans eighty-five acres and comprises approximately nine hundred trees. Many of our trees are over seventy years old. What’s the difference between Cape Fear and Elliot varieties? We like to compare the difference to large and small strawberries: A strawberry the size of your pinky, say, will often pack as much flavor as one the size of your thumb. Elliots and Cape Fears are similar in this respect. Elliots have a smaller kernal and carry a more intense flavor, making them excellent choices for snacking or salads. A Cape Fear, on the other hand, is a larger nut; still a great flavor, Cape Fears can make for impressive presentations on cakes and pies. We sell thousands of pounds of pecans each year, but the Elliot is by far our most popular nut. Their intense flavor and high oil content makes them very flavorful. Local people who grew up in the area and have an eye for pecans, usually ask for our Elliots. They consider us to be “out of pecans” when we’ve sold out of the variety.